Lawmakers hear several hours of testimony on measures to restrict utilities' use of eminent domain for infrastructure projects. AUGUSTA — Opponents of Central Maine Power’s controversial transmission line proposal through western Maine urged lawmakers Wednesday to restrict utilities’ ability to take land via eminent domain and to slow the permitting process. 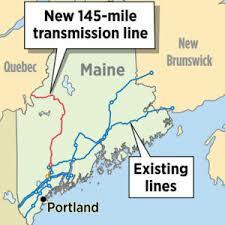 The hours of committee testimony took place one day before the Maine Public Utilities Commission is expected to vote on whether to issue a key permit for CMP’s 145-mile transmission line. PUC staff recommended approval of the $1 billion project that will deliver electricity from the Canadian energy company Hydro-Quebec to Massachusetts. How did Maine officials reach deal to accept CMP transmission line? This document sheds light. Debate over the project won’t end with the PUC decision because two more state agencies – the Maine Department of Environmental Protection and the Land Use Planning Commission – are conducting separate reviews. On Wednesday, opponents urged lawmakers to get more involved in the project’s fate. The Legislature’s Energy, Utilities and Technology Committee heard testimony on three bills spawned by a project that has split the environmental community but drawn fierce pushback from western Maine residents. One bill, L.D. 271, would prohibit utilities from using eminent domain to seize land unless the project improves the reliability of the electricity grid. Another measure, L.D. 1383, would require utilities to obtain approval from the local municipality or governing board before taking land by eminent domain. Duane Hanson said the transmission line would be visible from the home where his family lives off the grid deep in the woods of Township 5, Range 7. Hanson, whose family makes baskets and knives, said he considers it “an insult” to hear CMP officials suggest the project will not affect fish or wildlife along the corridor. He argued that local residents should have more of a say in such major developments in their backyards. “It would put the shoe on the other foot, where the local people would have a say rather than being walked all over,” Hanson said. A representative for CMP’s parent company, Avangrid Networks, said eminent domain would not be necessary because the company “has all of the right, title and interest for the project” along the current corridor route. Avangrid Vice President Thorn Dickinson acknowledged that could change if any of the regulatory agencies require CMP to reroute the transmission line but called that option a “last resort.” Dickinson also cited the $258 million in financial incentives – some spread over 40 years – as evidence of the benefits the line will bring to Maine. Gov. Janet Mills endorsed the project soon after that $258 million benefits package was announced, much to the dismay of opponents. Representatives of Maine’s other major utility, Emera Maine, testified against the bills to impose additional restrictions on the usage of eminent domain. Tony Buxton, attorney for the Industrial Energy Consumer Group that includes major manufacturers, suggested L.D. 271 could backfire on ratepayers by prompting utilities to classify all major transmission line upgrades as reliability projects. In turn, that could leave ratepayers on the hook for covering 90 percent of the costs, Buxton said. The sponsor of the latter bill, Rep. Seth Berry, D-Bowdoinham, said he tried to introduce the measure during the last Legislature but failed to gain the permission needed for a late-session bill. Berry said it’s not too late for the Legislature to get involved in a project he said has questionable benefits to Maine, although he acknowledged the bill’s language may need to be amended if the PUC approves the permit on Thursday. But opponents warned that Berry’s bill would send the wrong message to future developers by changing the regulatory rules in the middle of a project review. The PUC is slated to begin deliberations on the New England Clean Energy Connect transmission line proposal at 9 a.m. Thursday.